Admission is free to both sites of the Getty. Pay only for parking ($15 per car), or take a Metro bus to save even more. See more free museums in another section below. Getty Center near the 405 freeway in West L.A. displays many genres of art, including classical and contemporary paintings, sculptures and architecture. Getty Villa on Pacific Coast Highway in Malibu features classical Greek and Roman art and architecture. The cost of gasoline makes this more expensive than in the past, but still costs less than paying for parking and admission at a theme park. 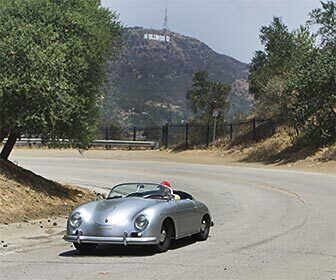 Cruise on Mulholland Drive - directions on how to get to the scenic areas of Mulholland Drive. Los Angeles Auto Tour - here's a suggested driving tour that covers beach views, mountains, the Valley, downtown LA and Hollywood. Click here to find a list of TV Show Taping links. In most cases you'll need to get your tickets in advance, but they're usually free. 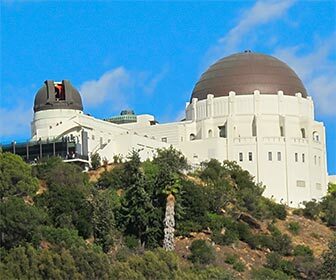 Griffith Park - Free activities include: Picnic in the park, go hiking on one of the trails, see the Griffith Observatory or visit Travel Town train museum. Court of Flags in Grand Park, downtown L.A. There are many free activities in downtown Los Angeles, although they are not all within walking distance of each other. However you can take a low-cost DASH bus to get around. Free activities include tours, famous tourist sites (such as Disney Hall and Olvera Street), and the L.A. City Hall observation deck. Parking will cost $5 or more (it's less expensive on the weekends), or you can take a Metro train into downtown L.A. Some shopping districts are more than just malls, and are an attraction in themselves. Many of them offer entertainment beyond what a mall provides. Some are in attractive locations, like near the ocean. Although it costs money to shop, the shopping districts listed here are places where you can walk around and stay entertained without having to buy anything. Most charge for parking. Click here for a list of Shopping Districts.